Also known as Lontra Canadensis, the North American river otter has a playful nature that captures the attention of those fortunate enough to watch. The recognizable long, slender body is built for sliding down muddy river banks and snowy hills. While they enjoy playing with others, river otters are typically solitary mammals that trek up and down miles of river bank each year. 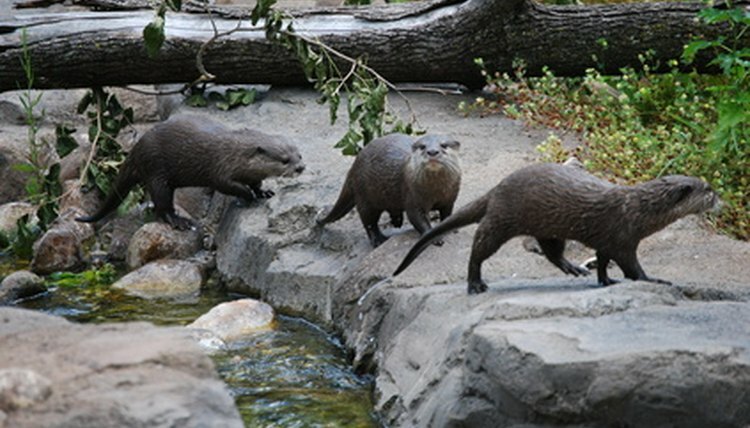 The average river otter’s life span varies depending on whether the river otter lives in the wild or in captivity. A river otter's life begins in an unusual way. After the parents breed and an egg is fertilized, the embryo becomes inactive in a stage called delayed implantation. The embryo won’t implant in the female’s uterus until environmental conditions are the most favorable for survival following birth. After implantation, the gestation period is 63 to 65 days. Newborn river otters are called kits, pups or whelps. They are born with a full fur coat and teeth already emerging. They weigh about 5 ounces and don’t open their eyes until they are 4 weeks old. At the tender age of 2 months, mama otter pushes the babies into the water for their first swim. She sometimes allows the pups to ride her back to teach them the art of swimming. Whelps are fully weaned by 3 months or 4 months. Kits live with their mother until the next breeding season, which is between a year and a year and a half. Pups reach maturity by the time they are 2 years to 3 years old. They measure 3 feet to 4 feet from head to tail and weigh 7 pounds to 31 pounds. Otters typically live 15 to 20 years in captivity, but the wild river otter life span is dramatically lower: Most live to be no more than 8 or 9 years old. They're not slow creatures. Though they have few predators outside of humans, they can scoot away from danger on land at a speed of 18 miles per hour. The North American otter’s mating season is in the later winter and early spring – roughly March and April. Females generally begin reproducing at the age of two. Males can start breeding at the same time but have more success when they are older. Females give birth to litters of one to five pups 10 to 12 months after mating. She doesn’t make her own den but takes over an existing one. Female otters have been known to move in with a beaver to share a den. What Do River Otters Sound Like? How Much Do Seals Eat in a Day?